Plans to rename the Assembly the Welsh Parliament are dropped, so AMs aren't MWPs. It's now proposed to just use the Welsh word Senedd. The Assembly's Presiding Officer says Mark Reckless can be a member of the Conservative group, even though he hasn't joined the Tory party. UKIP's leader in the Senedd, Neil Hamilton, has been ordered to apologise after telling a fellow AM that "suicide is an option". He made the remark to Labour's Eluned Morgan, who was expressing her regret that Britain was leaving the European Union. Today's a profoundly sad day for the nation and also for our children and our children's children. Of course, those who will pay the highest price for Article 50 will be those who can least afford it. AMs repeated to each other what they had heard Neil Hamilton say and the Lywydd (Presiding Officer) Elin Jones ordered him to apologise. He seemed reluctant to comply. What was unparliamentary about the remark? ... In deference to you Llywydd, I will apologise for whatever remark I am supposed to have made. Eluned Morgan said that she would have liked an apology as well but the Presiding Office ruled that she had accepted Neil Hamilton's apology on her behalf. AMs, Assembly staff and visitors have held a minute's silence in solidarity with MPs, who were also remembering those killed in the terrorist attack on Westminster. It took place at 09:33, the same time as the minute's silence in the House of Commons. Meetings of Assembly committees were paused and the flags outside the Senedd lowered to half-mast. We expect Assembly business to proceed as planned. Our security service and the police are working closely together. The police have increased the presence of armed officers around the Assembly estate and surrounding area as a precaution. The Assembly appoints experts to look at the idea of electing more AMs at the next election in 2021, as the present 60 are "over-stretched". Presiding Officer Elin Jones has told the Senedd that AMs, including ministers, should not resort to personal insults in the Assembly. 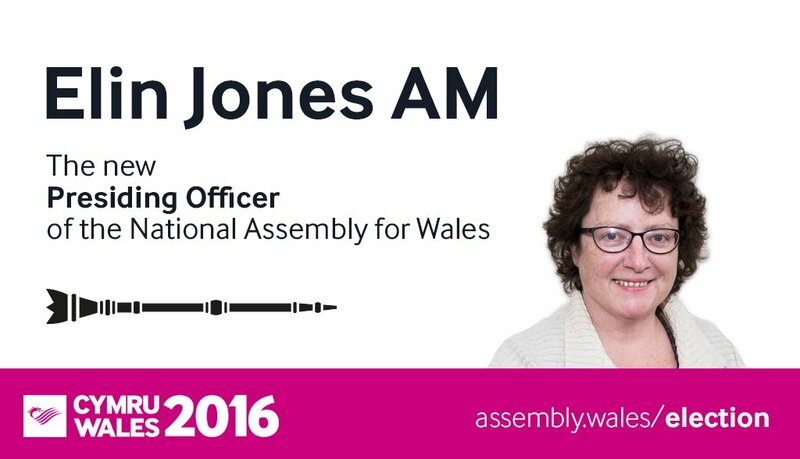 Ceredigion AM Elin Jones has been elected the new Presiding Officer of the National Assembly. She defeated her Plaid Cymru colleague Dafydd Elis-Thomas by 34 votes to 25. There was one abstention. The Presiding Officer holds significant powers and responsibilities that make the position the single most important office in the National Assembly for Wales. The role shapes every aspect of the Assembly – from its day-to-day operation, the routine management of business, to its development as the primary democratic institution in Wales, its position in the constitution of the UK and its standing in the eyes of the public. In paying tribute to her predecessor Elin Jones AM said: “Dame Rosemary Butler has been an excellent ambassador for the Assembly over the past five years." She has broken down barriers to participation in the democratic process in Wales, particularly amongst women through her Women in Public Life campaign; for young people by placing them firmly at the centre of Assembly business and created more opportunities to hold the Welsh Government to account. I look forward to building on her the success she has had in making the work that we, as Assembly Members, do here at the Senedd. Plaid Cymru's health spokesperson Elin Jones has responded to what she calls the "turf war" between the UK and Welsh Health ministers by claiming that Wales does consistently lag behind both England and Scotland on key health indicators. We have a Welsh Government that consistently sets itself lower targets on waiting times, access to diagnostic tests, and the ambulance service. It then fails to achieve these lower targets. When comparisons can be made between the 3 countries, then in some areas the Welsh performance is shockingly poor. Take for example, access times for an MRI scan. Only 1% of patients wait more than 6 weeks for an MRI scan in England, only 2% in Scotland, whilst 40% of Welsh patients are waiting more than 6 weeks. Other Welsh diagnostic waiting times fare no better. The Welsh Government’s answer to this is that demand for these tests has risen. It is true that demand has risen. But the rise has been even greater in the other countries. Over a three year period, the number waiting for an MRI scan in Wales rose by 33%, in England by 41% and in Scotland by 62%. This is therefore no excuse for Wales’ unacceptably long waiting times. Elin Jones added that Plaid Cymru wants to train and recruit 1,000 extra doctors and also re-examine the entire NHS workforce to "fundamentally realign our health and social care sector to finally integrate services fully". She claimed that it would lead to a system that could cater effectively for the elderly and frail, while keeping the NHS a free and accessible public service. And she blamed the First Minister for starting the row between the two governments by using his weekly question session as an opportunity to 'have a pop' at the UK Government. Elin Jones sets out two options to merge health services and adult social care which Plaid Cymru is proposing as a way of ending confusion and delays in the system. The options are: either to remove the responsibility for adult social care from local councils and give it to local health boards, or to scrap those health boards, transfer all non-hospital services to local councils and create a national hospital service.